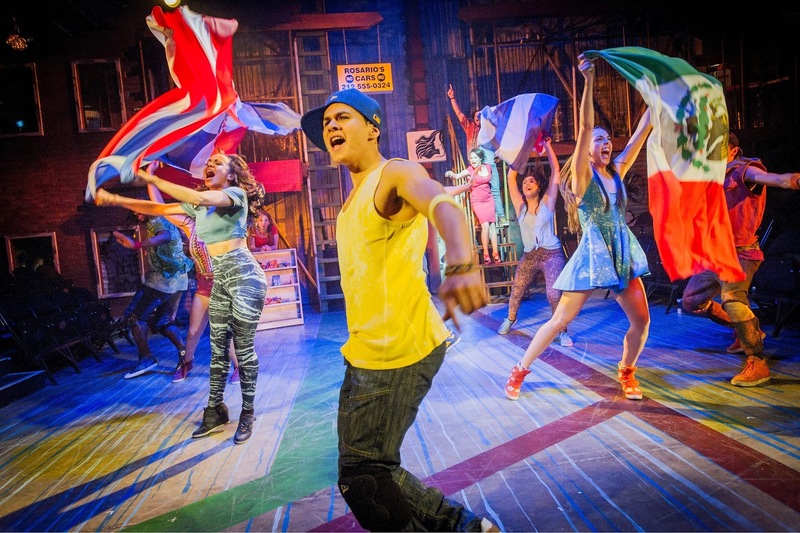 In The Heights makes its UK premiere at the Southwark Playhouse in a production that oozes talent. The show is a fusion of contemporary New York cultures, combining latin infused melodies with rap and blending salsa with breakdance. The music is invigorating and the imagery created by Drew McOnie's choreography and his ridiculously talented company are breathtaking. The story though lacks depth and whilst the show is mostly fabulous to watch, the plotlines are hard to care about. Set in Washington Heights, a famously latin New York district, the show revolves around the events in one neighbourhood (barrio) over the 4th of July period. The immigrant Latin American pulse of the show at times hints at what Bernstein and Sondheim created with West Side Story and indeed the creative trio behind this production's last collaboration, McOnie, designer takis and musical supervisor Tom Deering, was that Broadway classic, in the 2013 NYMT production (reviewed here).The signature of takis’ deign work is evident throughout, with corrugated steel suggesting the impoverished circumstances of the barrio’s residents. But where Sondheim’s lyrics are timeless, Miranda’s offerings are forgettable. The cast are gems. David Bedella is Kevin, the father of Nina (Christina Modestou) who has just quit Stanford University because she couldn’t pay her way. With the song Inutil, in which Bedella expresses his character’s sense of inadequacy at having failed to provide for his daughter, there is a glimpse of Bedella’s genius as he captures his character’s tortured soul. 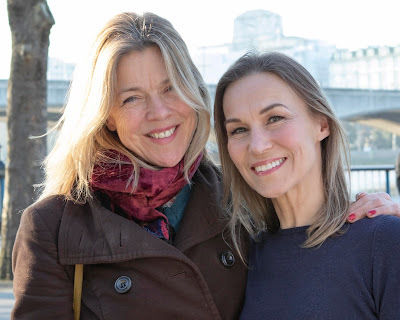 Alongside Bedella the entire company shine, especially the feisty and beautifully voiced Josie Benson who is a treat to watch as his wife Camila. Alejandro Postigo who has coached the cast in Spanish and culture has done a fantastic job and the show’s hispanic façade is as convincing as could be wished. Victoria Hamilton-Barritt is Daniela, the neighbourhood hairdresser and source of wise counsel (and gossip). She steals her scenes with poise, presence and impeccable timing. More of a a scene-setter than stealer, Nathan Amzi’s Piragua Guy is another touch of class. The moustachioed drinks seller (think Super Mario pushing a hot dog cart) deploys his beautiful tones with panache and its just a shame his role is so small. Sam Mackay does a sound job as the all-rapping Usnavi, delivering much of the show’s narrative in a worthy Eminem tribute. Not for the first time, the star of the production is Drew McOnie’s choreography. Whilst the Southwark Playhouse may offer a large performing space for a fringe venue, there was a compactness to the thrust staging that imbued the sense of cramped tenement accommodation. This is where McOnie is at his best, as he again sculpts his dancers into vivid flowing tableaux of movement and colour. Deering’s musical interpretations are bold for the tight space and his fabulous eight piece band perform brass arrangements with a pulsing gusto, as well as some gorgeous flute work from Hannah Riches. Gareth Owen needs to tinker with his sound design however as lyrics are sometimes drowned, especially in the multi-part harmonies. The book and lyrics may disappoint, but the singing, dancing and creative talent show the very finest of talent to be found in town, either on or off the West End. There is excellence at work here, go see.